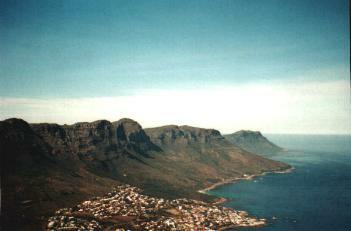 CAPE TOWN, OCTOBER 2000 - Table Mountain dominates the city of Cape Town. Every day - when the weather allows it - people go up the mountain by cable car or hike to the top. The sights on top of this mountain are really spectacular - one can see the city, Robben Island, the ocean,... and a lot of other mountain peaks nearby. One of the lower peaks one can determine is 'Lion's Head'. This is the one I climbed in an attempt to see table mountain in a different way. Climbing this peak is not technically difficult, but the path is not what one would call 'easy'. One has to walk mainly on a small path between the rocks - their are a couple of small ladders and even some chains (but you can avoid these last mentioned by taking a slightly larger route). 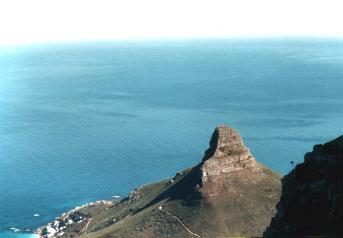 After an hour and a half walking, you reach the top and can enioy the beauty and silence of Table Mountain, The Twelve Apostles, Devils' Peak, Chapmans bay, etc... We sat their for about an hour enjoying the views. We saw the 'crowds' going up Table Mounting by cable car, the traffic down in the city - we were high above all this - untouchable in a sense. Down there, lived also the people struggling for their daily survival, homeless people sitting next to the road at night as we had seen the night before, but also the 'South-African jetset', the business people who had made it in this western style city. Time to get down again, back into the crowd, into 'real life'. Going down, we could see the clouds coming in from the ocean, trying to crawl up onto Table Mountain, in a desperate attempt to form the so-called 'Table cloth'. At one moment we saw the rock before us disappear into the mist of the coming clouds. Five minutes ago their was no cloud, now we were in the mist - just to remind us how quickly things can change.